It is a story of a life of cliff-hangers. She never knew whether it was going to be triumph or failure next, and indeed, this continued for the whole of her life. This story of cliff-hangers is set against the background of huge movements which were going on in India. I am not pretending to be a historian who can explain what was going on in India, but I have to be conscious of the background all the time. ~ excerpts from a lecture delivered at Gresham in 2012. Gresham College is an institution of higher learning located at Barnard's Inn Hall off Holborn in central London, England. Founded in 1597 under the will of Sir Thomas Gresham, and it hosts over 140 free public lectures every year. Sir Thomas Gresham, founder of the Royal Exchange, left his estate jointly to the City of London Corporation and to the Mercers' Company, which today support the college through the Joint Grand Gresham Committee under the presidency of the Lord Mayor of London. The early success of the College led to the incorporation of the Royal Society in 1663, which pursued its activities at the College in Bishopsgate before moving to its own premises in Crane Court in 1710. Getting back to the subject matter of that lecture Richard Sorabji threw new light on the life of the extraordinary woman who was his aunt as well as India's first woman lawyer. With the special insight and knowledge he possesses as Cornelia's nephew, and through scrupulous research in her unpublished papers, he tried explaining involvement with Katherine Mayo, her disagreements with Gandhi, her disappointments in her career and other crucial aspects of her life. Today Google has honoured her with a doodle in what would be her 151st birthday ! – some interesting news collated from various sites posted here. Google's doodle depicts Ms Sorabji in front of the high court to which she was eventually admitted. Cornelia Sorabji seen as India’s first female barrister, was never technically called to the English Bar. She studied for a law degree at Somerville College, Oxford, (1889-93), the first woman to sit the law exams in the country. Despite standing first in university examinations at the Deccan College, Sorabji had difficulty in becoming eligible. When Sorabji first arrived in England she stayed with Elizabeth Adelaide Manning, Secretary of the National Indian Association. At Oxford, Sorabji developed an enduring friendship with the Master of Baliol College, Benjamin Jowett. This granted her access to members of the upper-classes of British society, and consequently she remained loyal to the British through her career. Sorabji's memoir, India Calling, recalls the number of prominent establishment figures Sorabji met during her time in Britain. Sorabji became a member of Lincoln’s Inn in 1922, having been barred as a woman when a student. She lived and died in England ! In 1892 she was given permission to take Oxford's law exams; yet was not awarded a degree simply because she was a woman - a tradition that did not change until decades later. She went back to India in 1894, landed a job as a legal adviser for the Indian government, but she was not admitted to the Allahabad high court until 1923, when the ban on female lawyers was lifted. During her career she represented hundreds of purdahnashins - women who are forbidden by custom from talking to men outside their family. Wikipedia reports that she was also involved in social reforms, was associated with the Bengal branch of the National Council for Women in India, the Federation of University Women, and the Bengal League of Social Service for Women. Although an Anglophile, Sorabji had no desire to see "the wholesale imposition of a British legal system on Indian society any more than she sought the transplantation of other Western values." 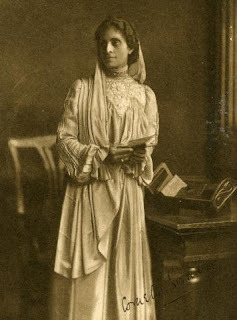 Though she supported the Indian Independence early in her career, Sorabji later adopted a staunch anti-nationalist attitude relating women's rights to the capacity for self-government. She was actively involved in promoting support for the Empire and preserving the rights of the Hindu Orthodox. She favourably viewed the polemical attack on Indian self-rule in Katherine Mayo's book Mother India (1927), and condemned Mahatma Gandhi's campaign of civil disobedience.